Can Database Marketing Work for Catalogers? Despite the downturn in the stock market, catalogs today are flourishing and have become the most successful direct marketing vehicles ever invented. Why is this so? Lightning fast fulfillment. Remember “allow six to eight weeks for delivery?” Who can stay in business today saying that? Many catalogers today even offer next day service. That means that they have had to streamline their warehouses, with UPS and Fedex trucks constantly backed up to their doors. Massive exchange of names. North America is about the only place in the world where you can rent names of mail order buyers. Almost everywhere else, marketers hold customer names in an Al Gore “lock box”. My wife, Helena, is an avid catalog shopper. She gets from eight to ten catalogs a day, all year long. She loves them, reading every page of every book as if they were novels. As soon as she places an order, the cataloger immediately rents her name out to fifty or sixty other competitors who rush to fill our mailbox. Without this universal name exchange, the catalog industry would soon die. Universally available credit cards. Not only do all catalogers depend on them, all consumers have them. Every American family receives at least two credit card solicitations per week. What does this mean for the catalogers? Financial success! The problem of getting paid for products has almost disappeared. Sophisticated Telesales. Today’s call center software is one of the most complex aspects of cataloging. Millions of agents staff centers on a 24/7 basis. The call center software recognizes previous customers using Caller ID, and calls their purchase history up on the screen, before the call is answered. The computer terminal screens enable the agent to find any product immediately, so that she can immediately begin to discuss colors, sizes and prices effortlessly. If the caller is a previous customer, the agent doesn’t have to get the name and address a second time. No hassle return policy. Modern catalogers make it very easy to return merchandise – and the best ones pay the return postage. Customers may exchange, get a credit or a full refund,with no questions asked! Such service was unheard of a decade ago, but has become standard. With all of these new developments, you would think that catalogers would be in the forefront of database marketing today. You would be wrong. While every cataloger retains the names of customers so that they can mail them catalogs, and rent out the names to other catalogers, few have a marketing database system. Recent studies show that catalogers with sales of more than $100 million per year spend an average of $18,000 on database marketing. Those with sales of less than $100 million spend almost nothing in this field. Why not? To explain this, let’s define what we mean by database marketing. In modern DBM, a company keeps track of customer purchases, and crafts special customer communications designed to build retention, referrals, loyalty and cross sales. Why aren’t catalogers doing this? Because they have a good thing going for them as it is. In theory catalogs could be personalized, with Arthur Hughes getting a catalog containing things that the sender assumes he would be interested in, and Helena Hughes getting a catalog from the same company with a different selection of products. No one does this. The reason is simple: the increased sales from personalization would not be sufficient to cover the cost of personalization. Catalogers print 200,000 or more identical copies, trying to get the per-piece cost as low as possible. They mail their house file plus thousands of rented names. This method keeps the marketing costs to a minimum. 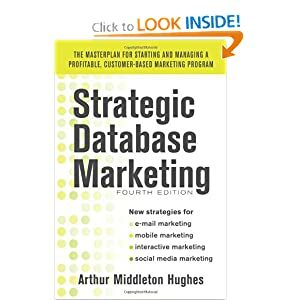 So, if you cannot personalize your communications, how can you do database marketing? You can’t, if we limit ourselves to direct mail. Well, I clicked, I bought it, and I loved it. This is database marketing. Most catalogers have built web sites. A month’s tally of Helena’s mailbox shows that 84% provide a way to shop on the web. Many of these sites are quite sophisticated and easy to use. Few, however, are personalized. As a Gold customer, Helena sees the same web site as a browser who has never bought there before. Few greet her when she returns with a hearty “Welcome back, Helena.” Even more annoying, they don’t remember her address and credit card number, so she has to enter this data all over again whenever she visits the site. What a nuisance! Total Web Sales: 15% or less. Few have been able to get their web sales up to or over 15%. Sales to web browsers. Most catalogers find that their sales are coming from the catalog, not from people who come to them from a web search. Catalogers report that the catalog produces more than 90% of their web sales. Web search for products is slow. Flipping through a catalog is easy. You can find what you want and order it. You can’t flip through a web site. To find a cardigan sweater in Appleseed’s catalog took about 45 seconds. To find the same sweater from scratch in the Appleseed’s web site took three minutes. To find the sweater on the web site, using the catalog number took about one minute. The colors on the web are not true. There is no way that you can know what user’s monitors are doing to your products. Out of stock is seldom accurate. When you call a telemarketer, her software tells her and she tells you that the item you want is out of stock. Web sites seldom do. As a result, you place the web order and find out by email in a few days that they are out of stock. After a few experiences like this, you stick with a live operator. Out of stock problems should not occur on a good web site. The other two problems will always be with us. So what can we conclude? Database marketing can work for catalogers using the web, but only if the web site is as good as what the telemarketer sees on her screen. Web personalization is very inexpensive, but very effective in building loyalty and cross sales. Cross sales can work on the web, but only if accompanied by personalization and collaborative filtering. The goal is to make the web so effective that the cross sales rate is equal to or better than that achieved by a telesales agent. The web is best as a ordering device, not a selling device. A typical sale taken by a telemarketer costs $6.50. The same sale over the web costs less than $0.10. Forget about web browsers, and concentrate on catalog shoppers. Get them to use the catalog and order on the web.